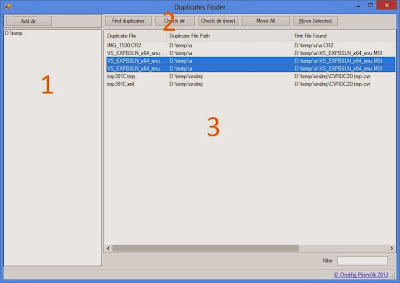 Duplicates Finder is extremely fast and efficient utility for finding and processing file duplicates on drives. Application window consists of 3 main parts. Part 1 is list of directories which will be searched for duplicates. Part 3 is list of duplicate files found. If file is moved first time directory selection dialog is shown (if selected path is shown in status bar at bottom left corner), subsequent move operations will be done in this directory. Directory can be changed later by clicking on it.